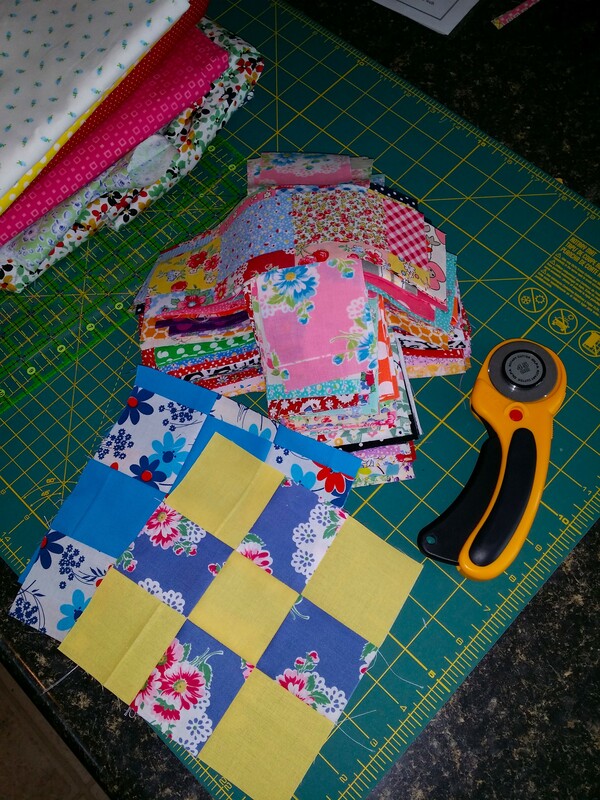 After finishing the flowering snowball (which has been mailed off to my mother as a surprise), I immediately started cutting fabrics for the second one but have only managed to get 3 of the 30 blocks together so far. 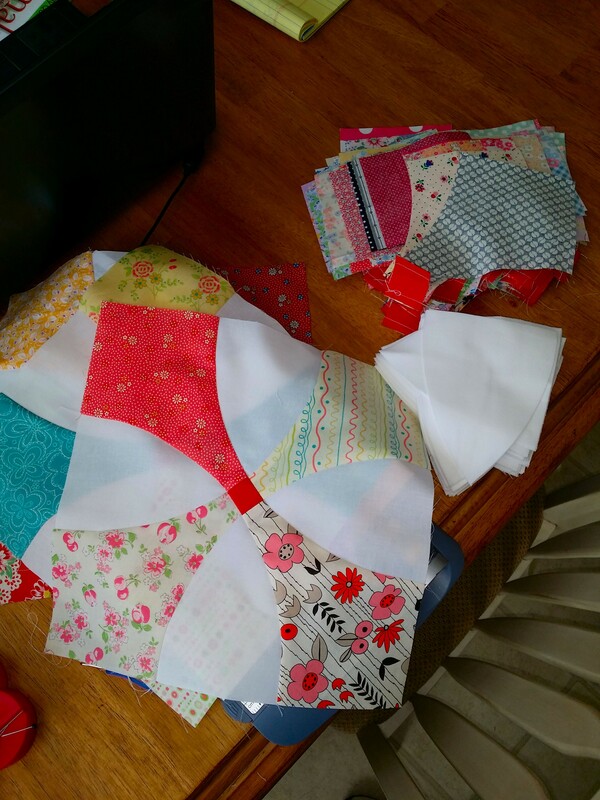 Mostly using the same fabrics but have added a few new ones to the mix for greater variety and to make it a little easier to arrange the blocks final placement without having the same fabrics too close to each other. Irritates me when that happens. 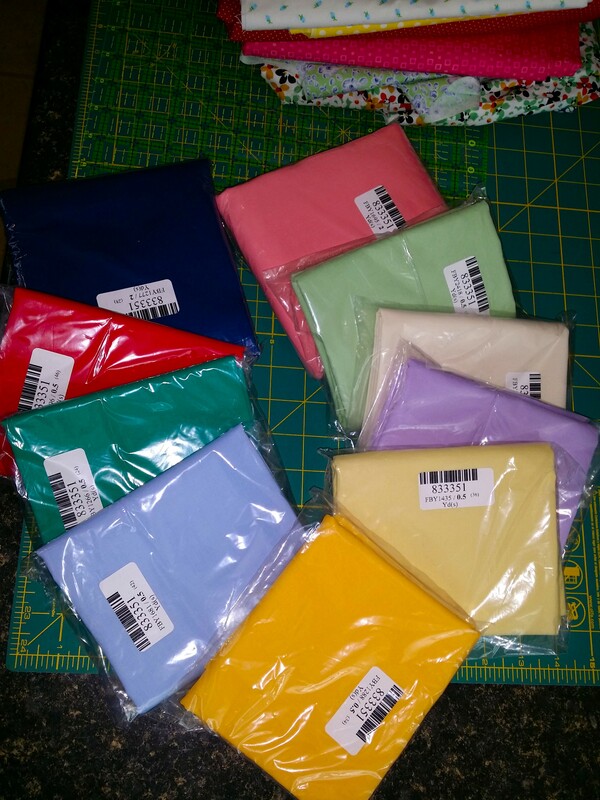 In addition to the flowering snowball, I’ve also cut a ton of fabrics for a nine patch that I’ve wanted to make forever. The cover photo on this blog is a nine patch that my Aunt Nannie made. I look at this quilt every single day and it amazes me to look at the fabric choices, both patterns and colors and that it’s all just sort of seemingly thrown together with no obvious color matching or anything but that it works! I completely love the absolute scrappiness of it. So, in keeping with how she did it, I plan to basically use no rhyme or reason to my piecing of the blocks. It may be hideous when I finish it (but I don’t think so). I’m using scraps of just about everything. Patterns, solids, stripes, florals, every color. So, we’ll see what happens! Of course, I’d probably be making faster progress on all of the above quilts in progress if it weren’t for this project that hubby and I started this past weekend. A custom sewing table. 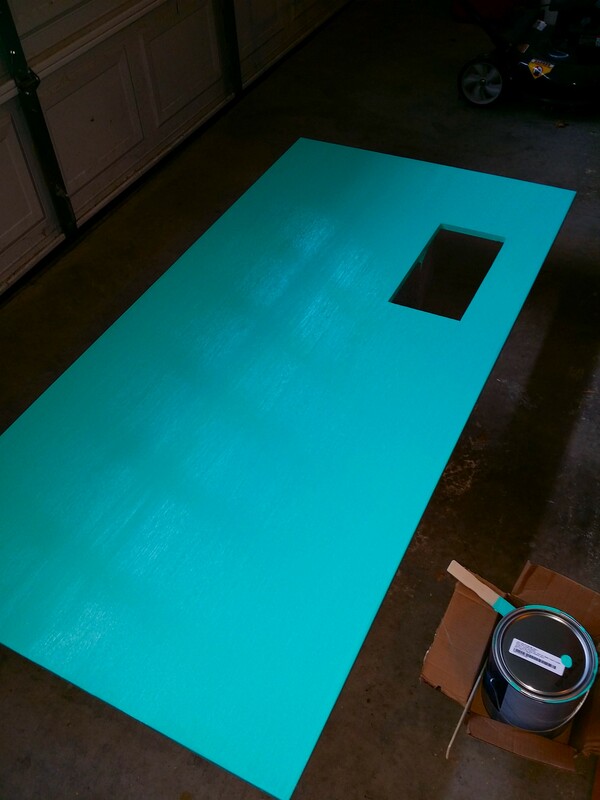 I’ve been painting since Sunday and am not finished yet (still have to put one more coat on one of the legs), then we can start putting it all together. I love the color! It’s called Cockatoo by Pantone Universe at Lowes. I had to have something bright and happy and I’m pretty sure I got it! 🙂 The cutting table will be next on the list. The nine patch blocks look pretty all stacked. So I’m sure they will look great all put together.